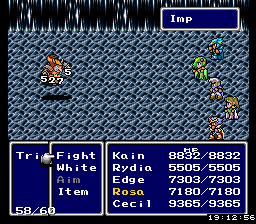 Of the 4 monster summons in FF4, the Goblin/Imp summon outright stinks. This hack improves the summon by changing it to use the same damage behavior as the Antlion’s Counter attack and the SwordRat’s Needle attack. 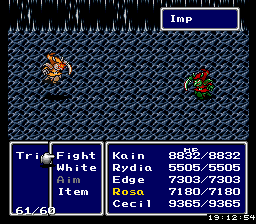 The change makes this summon extremely scalable and provides the best tribute to FF5’s Goblin Punch. In addition to this patch, a separate patch to make the Goblin/Imp summon look different was intended to be posted on Christmas… and eventually Valentine’s Day. 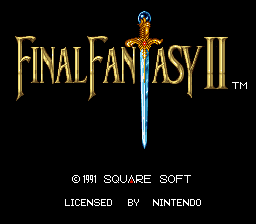 I admit, my laziness delayed this release (I was occupied with something more important anyways). That patch was not created by me, but by Dragonsbrethren with the use of Yousei’s Palette Editor.